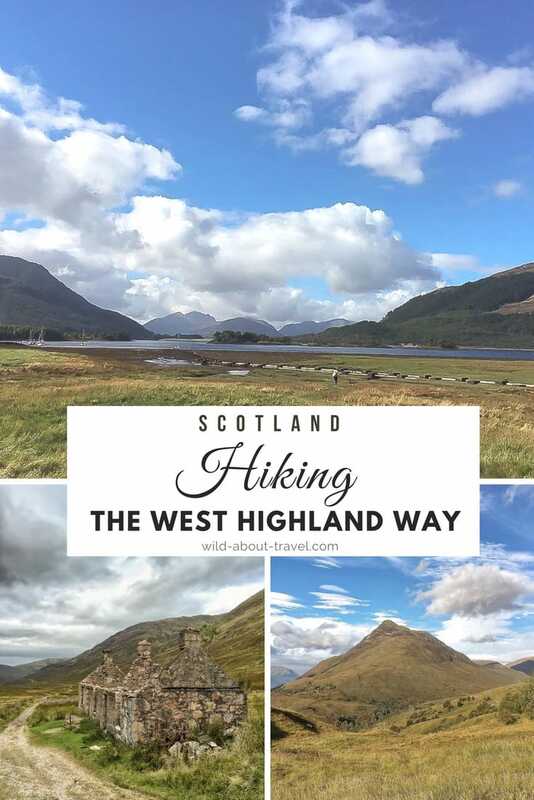 I hadn’t planned hiking the West Highland Way, probably the most popular long-distance trail in Scotland. It just happened. And it was an amazing experience. I knew I would go to Scotland in September to attend a conference (the STSInverness Summit) and from the beginning, I decided that it was the perfect excuse to stay a few more days. I had been to Scotland before, but only visited Edinburgh and Glasgow, both beautiful cities, and I was keen to see the wild landscapes I had admired so many times in pictures and books. I had no precise plan and thought I might visit the Scottish Highlands or the Isle of Skye. 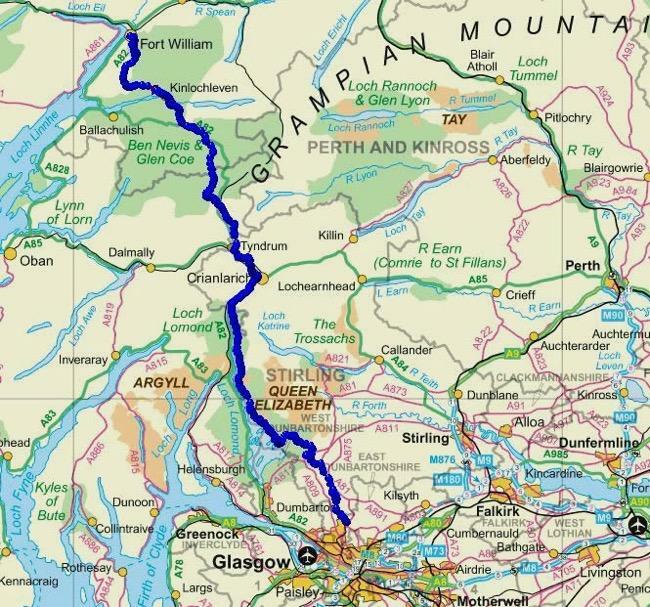 Then came my friend Laurel with a fantastic proposal: hiking the West Highland Way, the famous long-distance track. It took me a nanosecond to decide. I had only one concern. I love hiking, although I usually do short to medium-length walks, and that would be my first long-distance walk, something I had been willing to do for a long time. Laurel hikes like a pro, but would I be able to manage long hiking days, one after the other? 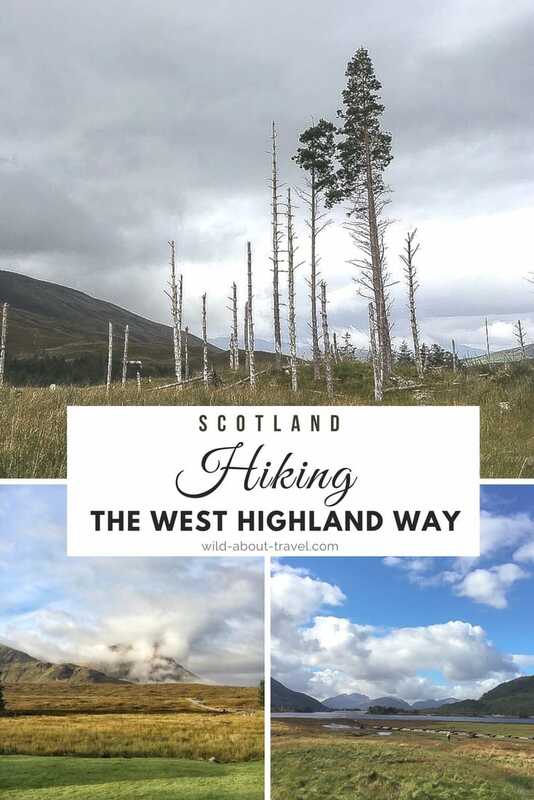 The West Highland Way: A beautiful hike between ever changing landscapes. 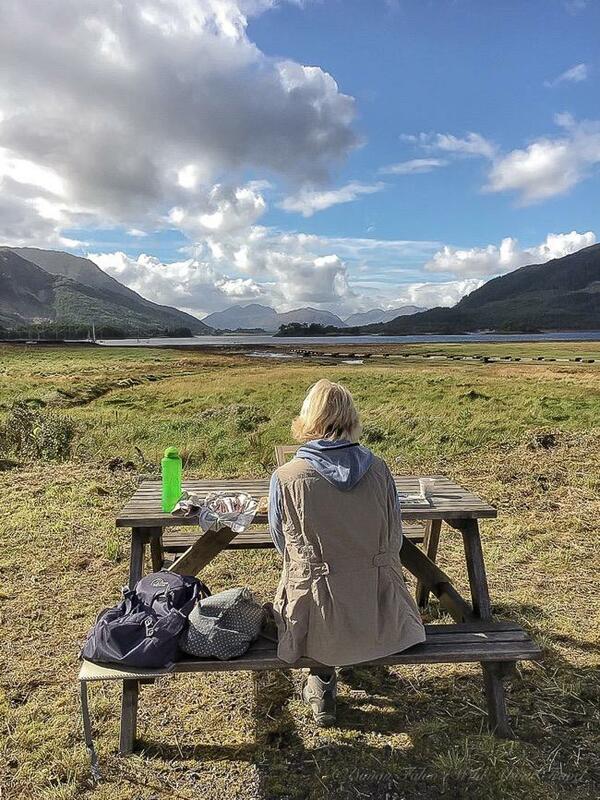 Stretching for 151km (93.8mi) from Milngavie (not far from Glasgow) to Fort William, the West Highland Way is the oldest long distance path in Scotland and by far the top choice by passionate hikers. The route is divided into 8 stages of various distances, although it can be walked in 7 legs and we even met people along the way making it in 6 days which, believe me, is quite a challenge. I only had 6 days, and being totally out of shape, there was no way I could shrink the stages at their maximum, thus I had to skip the first leg and started hiking from Drymen. Walking 23km (14.3mi) on the first day meant asking a lot from my untrained legs, and I had to take several breaks to give a rest to my aching muscles and feet that seemed on fire. The strain did not prevent me from enjoying pretty Balmaha and the colorful boats moored in the small cove, the view on Loch Lomond from atop and the lush forest, where green and brown-reddish are the dominant colors. When I eventually arrived in Rowardennan, in the late afternoon, I felt exhausted and utterly proud of myself. Before dinner, nature rewarded me with a beautiful sunset over Loch Lomond. I could not have imagined a better way to end a challenging day than a wonderful sky on fire. The stunning scenery around Loch Lomond. 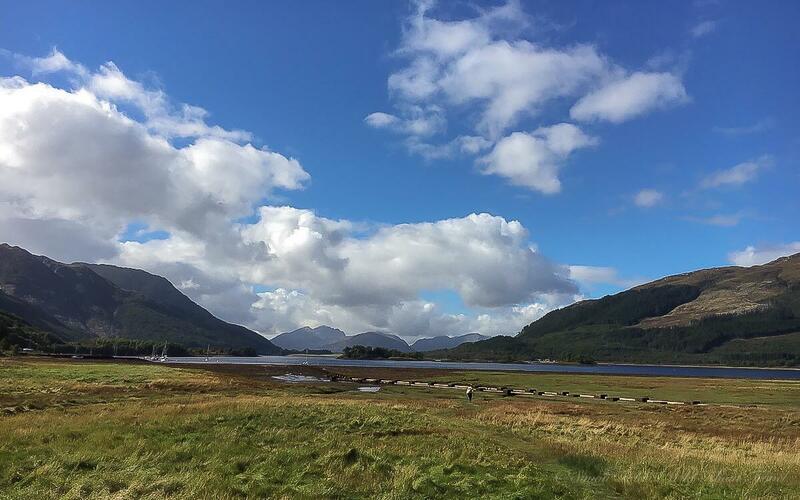 The stage between Rowardennan and Invernarnan is often referred to as the toughest of the West Highland Way. While I have to agree, I also found it was one of the most scenic and it ended up being my favorite day, together with the final leg. The path goes through lush forests, where the only sound is the soothing flowing of the creeks. 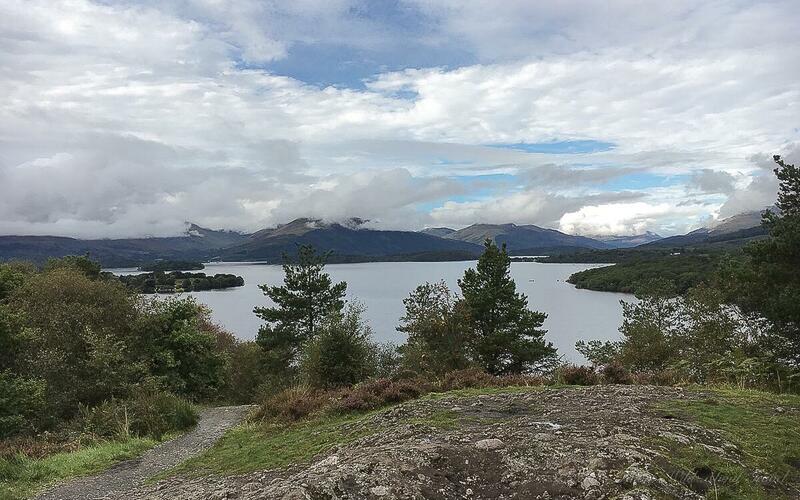 Along the way, astounding views on Loch Lomond, beautiful even under the cloudy sky. After all, that was the kind of weather I expected in Scotland. From Invernarnan onwards, the landscape becomes starker and more mountainous. These are the Highlands I had imagined: barren, isolated, wrapped in an air of mystery. There are also fewer people walking, and there will be even less the further I walk toward the end of the West Highland Way. The leg between Tyndrum and King’s House was the longest one: 29.9km (18.6mi). Indeed, that stage can be split into two shorter hiking days, but then hiking the West Highland Way would have taken 8 days, which we didn’t have. Such a long distance was too much for me (of course, Laurel walked it, and even quite fast), so I hiked till Bridge of Orchy and from there I caught a bus to Glencoe, where we would spend the night. That bus ride was one of the most scenic journeys I ever had. The typical Scottish shower which had welcomed me in Bridge of Orchy ended right at the moment the bus arrived. In a matter of minutes, the sky opened, the sun started to shine between the sparse clouds and the light and colors were just magic. The wild beauty of Glencoe reminded me a lot of New Zealand, with its wide solitary landscapes sprawling as far as the eyes can see. No accommodations were available at King’s House and Kinlochleven, thus we ended up overnighting in the charming village of Glencoe for 2 consecutive nights. With its pretty whitewashed houses adorned with colorful flowers and the lovely lakeshore, it was a nice detour. And I was glad, for once, not having to pack early in the morning. The walk between King’s House and Kinlochleven is the shortest leg: “only” 14km (8.7mi), which I covered easily, feeling my legs cooperating a lot more. Perhaps because of the gloomy weather, it was also my least favorite stage as for the landscape. 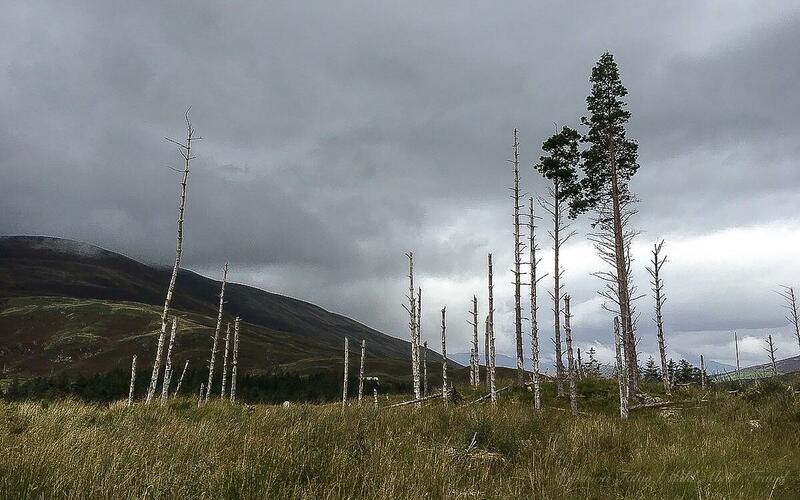 Hiking between Kinlochleven and Fort William felt like walking in a wild wonderland. Back to Glencoe relatively early, I enjoyed an afternoon relaxing and resting before tackling the last stage of the West Highland Way the following morning. I knew if would be hard, considering how little in shape I am, but I wanted to make it. 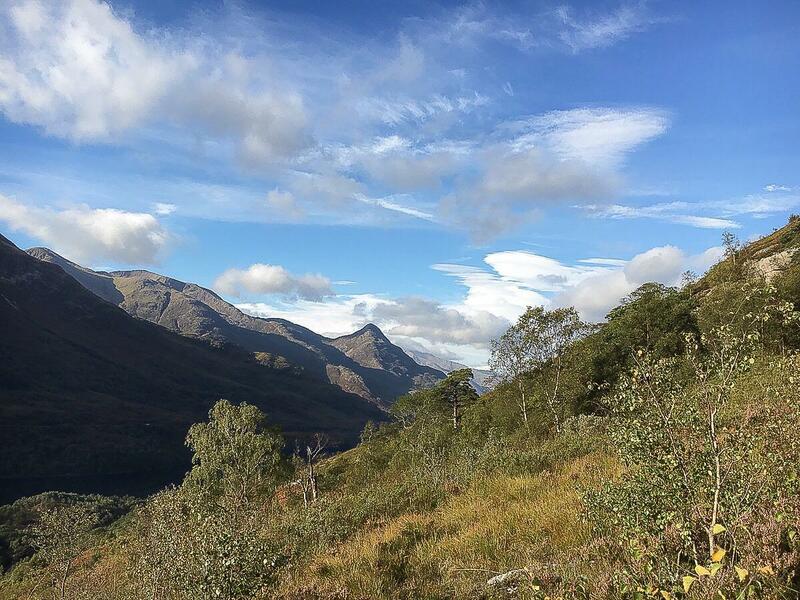 The 24.5km (15.2mi) long trail between Kinlochleven and Fort William is “take it or leave it” since there’s no public transport along the way. Indeed, this is the wildest stage, the trail going through an isolated area with barely any trace of human life. It’s the most scenic leg and the one I enjoyed the most. After the initial ascent through the woods, the path reaches a wide open area with beautiful views on Loch Leven (on the back) and the mountains all around. Temporarily blessed by good weather, I walked in awe. Colours popping up under the sunshine, a deep blue sky that seemed incredibly deep, sparse clouds adding a wonderful dramatic effect: I felt like I was hiking in a land of perfection. The clouds became progressively thicker as I walked the long stretch in the glen, an area so remote that it looks unreal. No signs of human settlements for kilometers, except for the Tigh-na-sleubhaich ruins, standing lonely between the mountains. Once I reached the forest, a few hours later, I knew I was approaching Fort William. By then, it had started to rain but I felt too tired to care. Still a few kilometers to go. I bit the bullet and went on walking until I reached the sign that officially marks the end of the West Highland Way. I felt exhausted by happy and utterly proud. The West Highland Way was my real first distance hike. It sure won’t be the last. Have you ever made a long-distance hike? How was it? Glasgow is the nearest airport or, as an alternative, Edinburgh. Milngavie, where the West Highland Way starts, can be reached by bus or by train from Glasgow (ca 30-40min) and Edinburgh (ca. 1h40min-1h50min). Also, Fort William is connected by bus and rail to several destinations. Independent hike: many young people walk on their own and camp along the way. 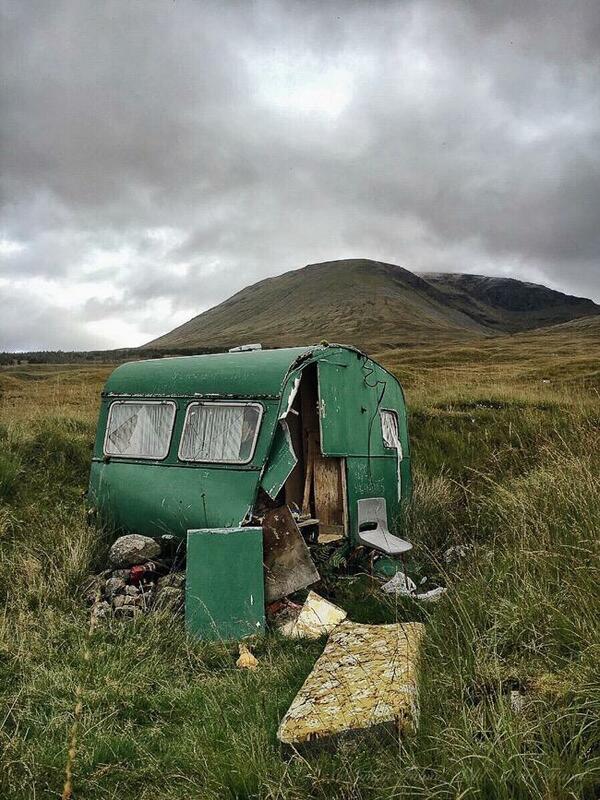 Wild camping is allowed in many areas of Scotland, provided campers follow the “leave no trace” rule. You can also walk by yourself and book your accommodation directly. Plus: in case you’re camping, you can harder get wilder and you’ll have a full immersion in nature. Wild camping gives you the freedom to stop when and where you wish, regardless of the “official” arrival of the stage. If you want to allow yourself more comfort, staying at B&Bs or guesthouses, you can often stop in-between a stage, meaning shorter daily walks and a longer time to complete the trek. Minus: camping means carrying a heavy backpack, lack of comfort, no one to rely on in case of emergency. If you’re looking for more comfort but want to do everything without an agency, I strongly recommend booking your accommodation in advance. 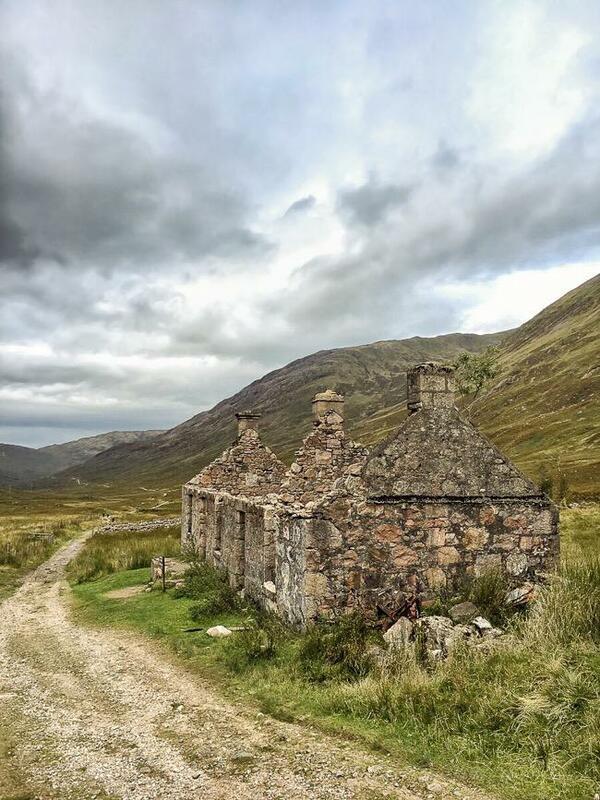 The West Highland Way is the most popular hike in Scotland and you’ll see “no vacancies” signs more often than not. You won’t want to sleep under the stars after a long day, right? Self-guided with booked accommodations and luggage transfer: this is the option Laurel and I chose, and we had everything perfectly organized by Wilderness Scotland, an adventure travel company specialized in active holidays in the outdoors (there are of course other companies offering packages). Plus: You can walk at your own pace and stop along the way at leisure. Accommodations are booked, so after a long (and often tiring) day you head straight to your B&B or Guesthouse, ready to jump under the shower and right after on the bed for a little, well-deserved rest. The luggage transfer enables to hike with only a day backpack, and that makes quite a difference on a long walk. Additionally, Wilderness Scotland provided us with detailed notes and a good hiking map, making everything very easy and smooth. It’s a great way to combine flexibility with comfort, enjoying the warm Scottish hospitality. Minus: no one to rely on in case of emergency, in an area where the mobile coverage is intermittent. Also, you don’t benefit from the knowledge of local guides, who can enrich the experience with information and anecdotes. Guided tours: There are many reasons to opt for a guided tour, especially if you’re a solo traveler. Plus: A guided tour is a perfect option to meet people sharing the passion for trekking and, if traveling alone and not used to solo hiking, it certainly would make you feel safer. Furthermore, a guide is a very valuable source of information on history, nature, traditions, and an invaluable help should you hurt yourself. Being in a group means also having dinner together, chatting and sharing the best moments of the day, perhaps even meeting people that will become good friends. Pre-booked accommodations and luggage transfer allow you to face a long-distance hike treating yourself with a degree of comfort that will make the trek all the most pleasant. Minus: A group tour is inevitably less flexible, although this is generally a minor point. You might as well have to deal with people much fitter than you, or being the one in the best shape, therefore having to adapt to the rhythm of the group. 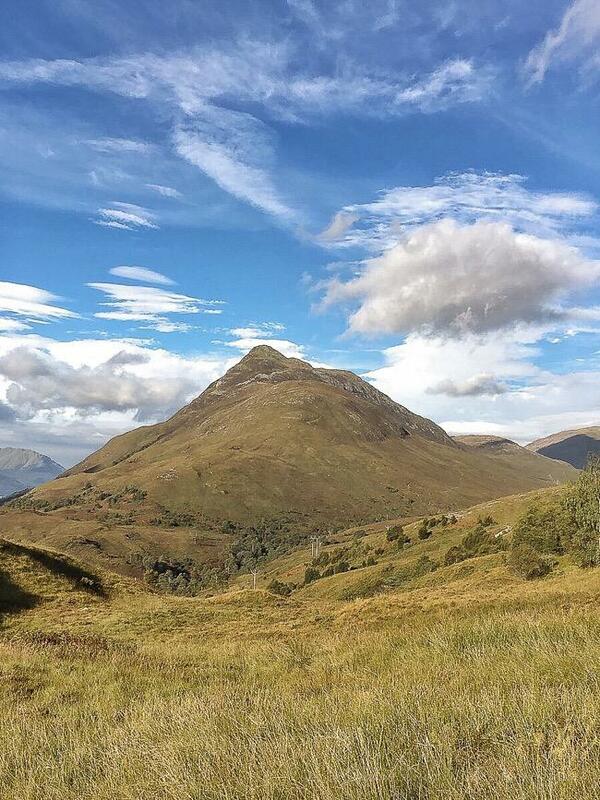 It is possible to hike the West Highland Way all year long, although most people choose the period between early May and the end of September. Late Spring and September are considered by many the best months. July and August are warmer, but you’ll likely struggle with the annoying midges. 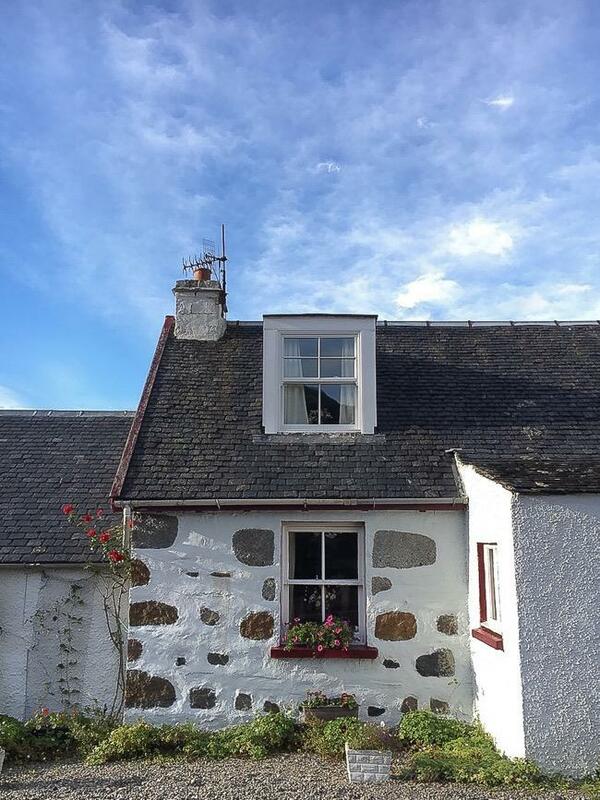 Drymen: Braeside Guest House – Cosy, drying facilities available, lovely hospitality. Rowardennan: Rowardennan Hotel – Wide garden overlooking beautiful Loch Lomond, where we were treated with a fantastic sunset. Comfortable rooms, drying facilities and nice, easy-going restaurant. 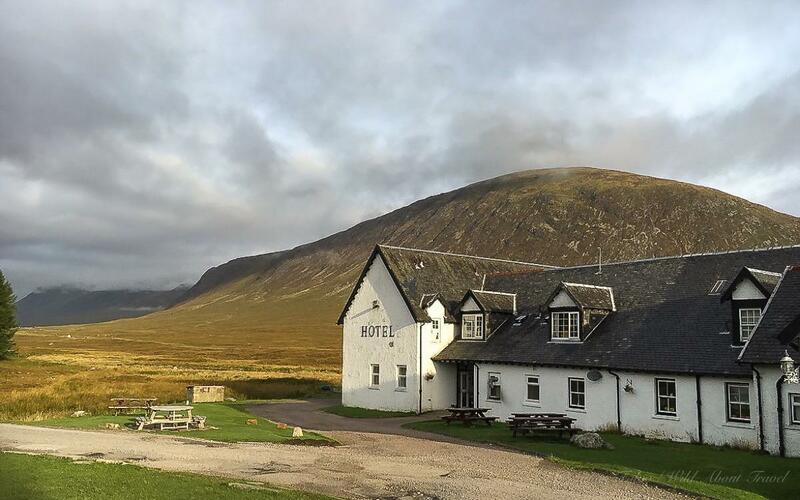 Inverarnan: Drovers Lodge – Large, quirky rooms that not everyone might like, but the pub/restaurant is very lively and you’ll meet many others hikers. 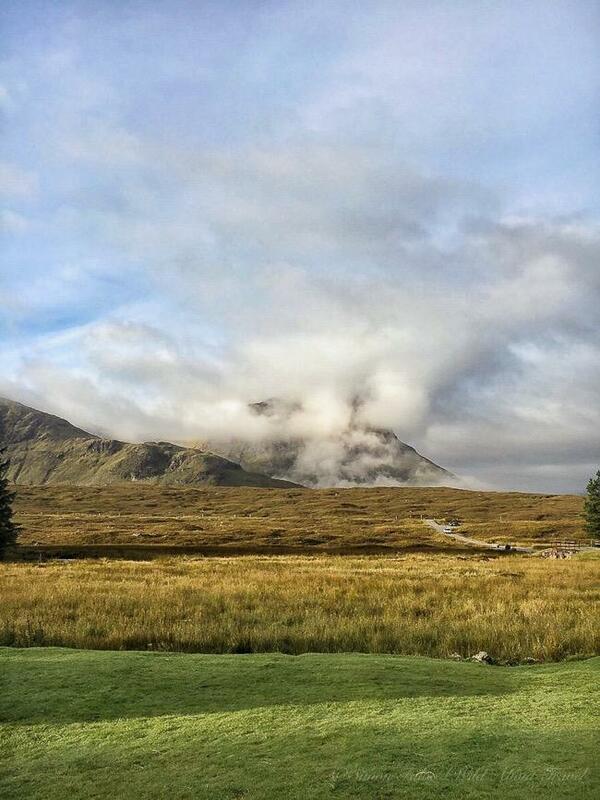 Tyndrum: Kilbride Lodge – Cosy cottage, drying facilities and exquisite hospitality. Note: Wilderness Scotland kindly provided me with a complimentary self-guided tour. Opinions, as always, are my own, as was the amazement for the Scottish Highlands’ beauty. Stunning photos and great post. I love the nature! Maybe I will do something like this some day, but I am not an experienced walker. Nice blog. My name is James Maddock. Actually i am searching for a best place to visit in Europe. After reading this i am decided to go to Scotland. Thanks for sharing this information with us. You can’t get wrong with Scotland, James. The country is so beautiful, and the colors so special! What beautiful photos! 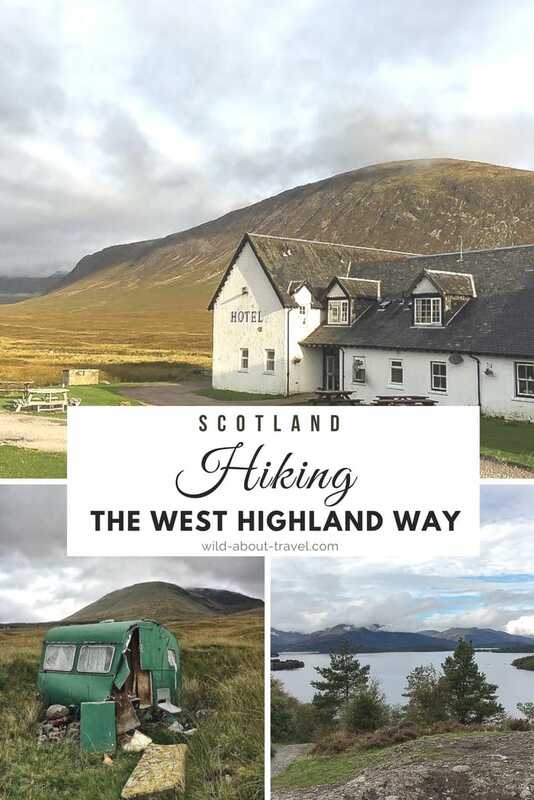 I’ve never done a long-distance hike, but this makes me want to tackle the West Highland Way – I’m from Scotland, but have only ‘stepped’ onto the trail while at Loch Lomond. It’s on my to-do list now! I’m so glad you liked the photos, Katie. Being from Scotland, it should be easy for you hiking the West Highland Way. Just beware that some stages are quite long, so if you get the chance to train a bit before starting the walk it will sure help. Great post! I’m glad you liked the WHW, you seemed to get pretty good Scottish weather as well! My bff and I did part of the WHW in May, as mentioned in my blog post (http://www.angusandvivianadventures.com/west-highland-way-ben-nevis/) and we weren’t so lucky with the weather. We even wild camped every day we were there…. so let’s just say we were pretty wet and tired after. What was your favourite part/area? Yes, I was surprised by the weather and felt very lucky! You were brave, deciding to wild camping. I don’t think I could do that. My favourite area? As I wrote, Loch Lomond and the last leg.